Subshrubs or shrubs [annuals, perennials], 10-50(-100)[-250] cm. Stems mostly erect, branched from bases and/or throughout. Leaves cauline; opposite; petiolate or sessile; blades (3-nerved [pinnately nerved]) trullate to lanceolate or lance-linear [deltate, elliptic, filiform, linear, ovate], sometimes ± 3-lobed, bases cuneate to truncate, margins coarsely toothed to subentire, faces hispid [scabrous to scabrellous or strigose to strigillose, ± sericeous, often with finer, uncinate hairs as well], usually gland-dotted. Heads radiate (discoid), borne singly [in corymbiform arrays]. Involucres obconic to hemispheric, 4-8[-15] mm diam. Phyllaries persistent, 8-16+ in 2-3+ series (outer usually larger and/or more herbaceous than inner). Receptacles convex, paleate (paleae conduplicate, chartaceous to scarious). Ray florets 0 or 4-18, pistillate, fertile [neuter]; corollas yellow to orange [purplish or white]. Disc florets 8-150+, bisexual, fertile; corollas yellow to orange [purplish], sometimes marked with purple, tubes shorter than or equaling funnelform or cylindric throats, lobes 5, deltate. Cypselae ± dimorphic; peripheral sometimes obcompressed and weakly 3-angled, inner compressed and biconvex or flattened [somewhat 4-angled] (some or all winged, all ± rostrate, bearing central neck or boss apically, some or all each bearing wartlike elaiosome at base); pappi persistent, cyathiform (fimbriate cups plus 0-3 coarse bristles or awns borne together on rostra). x = 13- African aspilias may belong within Wedelia. 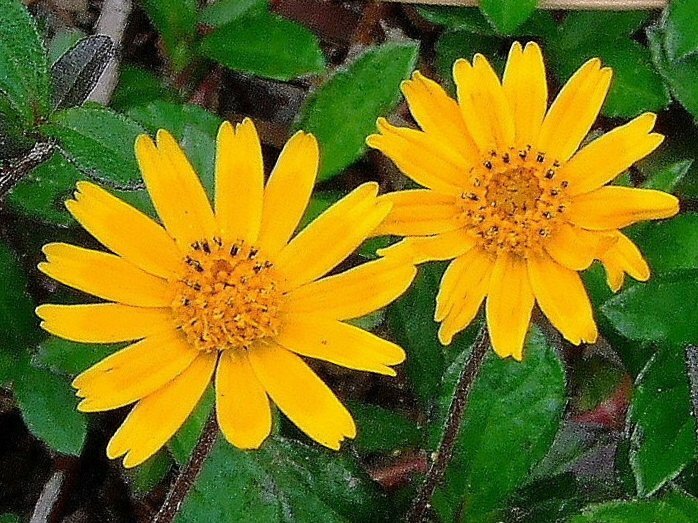 Wedelia glauca is treated herein as Pascalia glauca, W. trilobata as Sphagneticola trilobata. A report of Stemmodontia asperrima (Sprengel) C. Mohr from ballast may be source of reports of W. calycina Richard or W. frutescens Jacquin from Alabama. I have seen no specimens to support those reports.